Derby had a regularly scheduled farrier appointment on Saturday that wound up being pretty eventful. I got out to the barn early to go look for the three shoes Derby has thrown that I’ve not yet retrieved from his field. Walking every inch of the turn out, I was able to find one. Though I was disappointed to not find the others, I was happy to see that about half the field was drying nicely. That said, the front third is still a morass of gooey, sucking mud. As I tramped around, the sky darkened, and to my total disgust, fat raindrops started to fall. The farm owner had seen the storm on the radar, and had kept the horses in. Hopes of the storm breezing past vanished quickly as the rain – and later the hail – fell in earnest. As the storm raged, Derby stood quietly as I picked mud out of his ears and rubbed his forehead. Joe cleaned up Derby’s hooves, commenting that they were pretty soft due to being wet for so long, and suggesting that I start painting them with Keratex. He took a break as the storm really kicked up, causing the horses in their stalls to rear and pace. Derby merely stuck his head in my armpit and tried to hide. Things quieted down to the point were Joe felt OK about resuming work on Derby’s back feet. After about a minute of work, he exclaimed, “Oh. OH! EWW.” Apparently he found an abscess on Derby’s right hind, in the same rear quarter where he had one on January. Derby hasn’t been lame on that foot (though I out off town for a while, so who knows) and it looks like it may have been draining for a bit. The good news is that (touching wood) Derby isn’t lame. 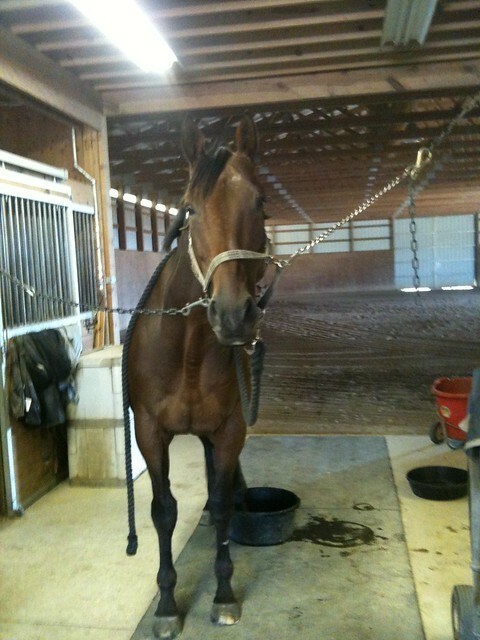 I didn’t have time to ride but turned him loose in the indoor to play once Joe was done, and he looked really good. I did finally have a decent ride today. We went for 30 minutes (I’m still taking it easy since he’s been off and has definitely lost condition) but about half of that was solid trot work, so I feel like we’ll be able to have some decent lessons with Christy this week. It will be good to get back on track, and I’m looking forward to a week in which I return to my normal routine. Derby has been stuck inside for days now, nursing a hugely blown abscess that exited via one of his heel bulbs. The ground is still muddy, so for now, he’s in. He’s actually handling it extremely well, due in part because I am able to wrap the foot well enough to keep the wound clean while he enjoys some playtime in the indoor arena. Early this morning, I turned him out as the other horses were being taken outside. He didn’t frolic. He stood in the middle of the ring, ears swiveling, and then whinnied forlornly. It was such a sad little whinny. Poor kid. 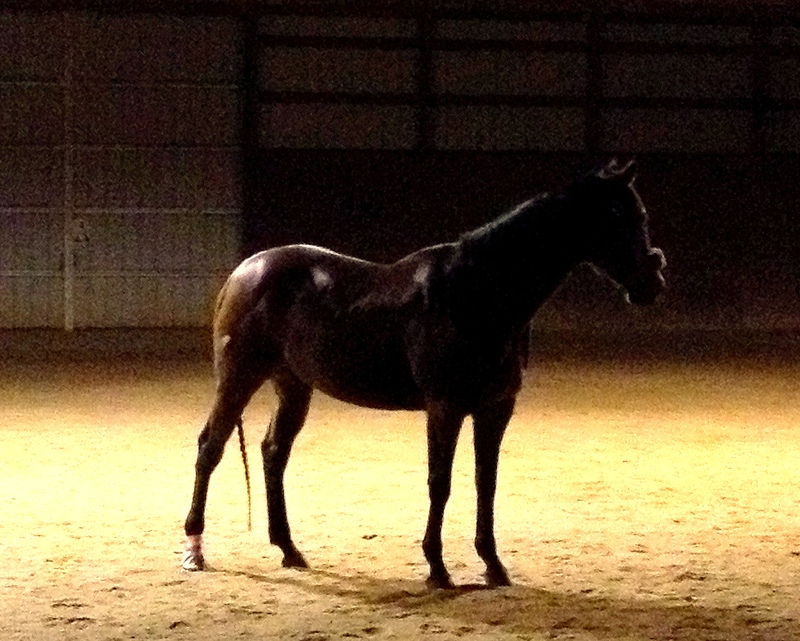 He’s convinced that he’s been abandoned by the herd, consigned to be forever alone in the arena. It’s snowing and freezing today, so tomorrow he gets to go out. And he’s going sound, so I’m going to get on for an easy ride tonight. He’s over the hump, and he’s such a good boy. Hang in there, Derbs! I didn’t need to look closely to know the answer, because in addition to standing happily in deep shavings on his ouchy foot, a tell-tale odor emanated from him. Abscesses are stinky, and this one was particularly foul. I cleaned up the leg and had a look. An icky wound oozing pus now graced Derby’s magically deflated right heel bulb. It’s still tender, and he didn’t appreciate my cleaning it, but we got the job done. Due to the muddy conditions, he’s staying inside for a few days to give it the chance to heal. But hopefully, we’ll soon be back in business, and back in the saddle. 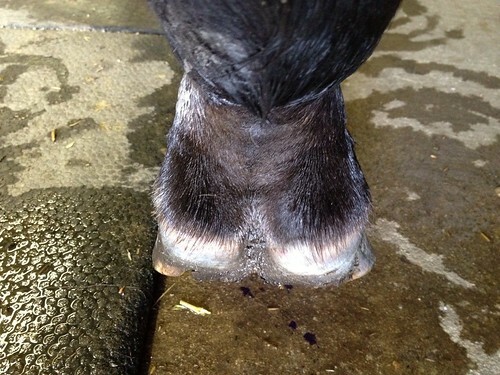 Derby's ouchy heel - the right bulb is swollen. It’s day number God-only-knows-what of gooey mud here, and about a week or so into Derby’s lameness. I mention the mud because I meticulously clean his legs every time I go out to the barn – which is normally six times a week. Over the last week, that right hind on which he’s been off has been a little tender to the touch, but with no evident heat or swelling. After doing a thorough lameness exam, including flexions and hoof testing (all was fine), Dr. Nicky told me not to worry too much about it, was probably just a tweak due to the awful muddy footing, but nothing serious. Well, I got a little relief today when I went to see Derbs. As I was cleaning that foot off, he snatched it away, holding it up for a minute. Clearly, my gentle attention with a soft jelly scrubber wasn’t gentle enough. Once I got a decent amount of the mud off, I was able to feel that one of his heel bulbs was hot, angry and inflamed. I carefully wiped the mud away and took some pictures, which I emailed to my vet. Without having her input yet, it appears to me that he’s brewing some kind of abscess. I hope his body just resorbs it, rather than blowing a big hole out his heel. As gross as that scenario would be, however, it’s better than having an issue with a suspensory or the joint. So, I’m relieved, even if poor Derby isn’t. He got another couple grams of bute, eased along by a lot of molasses, and some extra cookies for his woes. Generally speaking, I wouldn’t wish an abscess on any horse. But given the alternatives to the weird lameness Derby exhibited over the weekend, I was hoping and praying for an abscess. I’ll take gravel over stringhalt or a suspensory any day. Happily for us, Dr. Nicky found a bruise and abscess in short order. She was able to open it and get it draining, and Derby is already moving more comfortably. Our immediate future involves twice-a-day soakings and handwalks. Derby is a stellar patient, which means his prescribed treatment from the vet will be augmented with ongoing cookie therapy too. It was a beautiful weekend, and on my way to the barn on Saturday, I got a text from Christy suggesting a trail ride. Awesome! But as they say, “Man plans, and God laughs.” Because Derby came up lame. It was pretty strange – he led in from turnout OK (though I will admit that I wasn’t watching him closely.) I stuck him in his stall to have a private moment and relieve himself before I tacked up. However, when I opened the stall door, clipped the shank to his halter and invited Derby to come out, he refused, which was really strange. I cajoled him a bit and he came out, at which point I backed him three steps into the cross ties nearest his stall. That’s when things started to go South. As I was currying Derby, he started to stumble (for lack of a better word) and shift uncomfortably. I unclipped him and walked him around, and he off on his left hind – and it got progressively worse. He was striding with that leg as though he had stringhalt, snapping it up toward his belly and then forward, and when standing, he would lift and flex the leg upward. We walked through the barn into the arena, and there, on the soft footing, things got really bad. He looked like he was going to fall down. Without further ado, I took him back to his stall. His strides steadied a bit in the aisle but he certainly didn’t look sound. He had a little heat in his gaskin, but he would bear weight on the leg (I could actually pick up both hind feet without a problem. I called the vet, who said it wasn’t an emergency (because he would bear weight on the left leg) and she instructed me to give him 2 g of bute and see how he was on Sunday. Derby was a bit better yesterday, walking more comfortably, though he still looks awful on soft footing. He wasn’t doing the strange lift-and-flex routine with his left leg, though that leg will occasionally hover a bit. His temperature and respiration were normal, and he was bright and interested in his food, until I gave him some bute paste via a syringe in the mouth. At that point he turned tail and sulked in his stall for a good half hour. Worryingly, there is now a digital pulse in the pastern on the left hind, and the hoof felt a little warm this morning. The vet is coming tomorrow. I hope it proves to be something simple, like an abscess, though the symptoms have been strange. Fingers crossed.